First let me explain that I majorly messed up. To prepare for my visit today I charged my Nikon camera battery overnight and then neglected to put it back in the camera as I packed gear for the day. I suppose that is what a multitasking mom gets. I did remember to pack all the gear necessary for my kids soccer games. Sigh. After spending a wonderful day touring the gardens, I came home to download the photos and in my haste, I did not get them downloaded but did manage to delete them off my camera. So, I highly encourage you to visit the photo slide show on the website of Arbutus. Clearly, I need to go back with my Nikon and get proper pictures. The display gardens are gorgeous, with a rich variety of species that would warrant a second photo attempt. Allow me to back up. 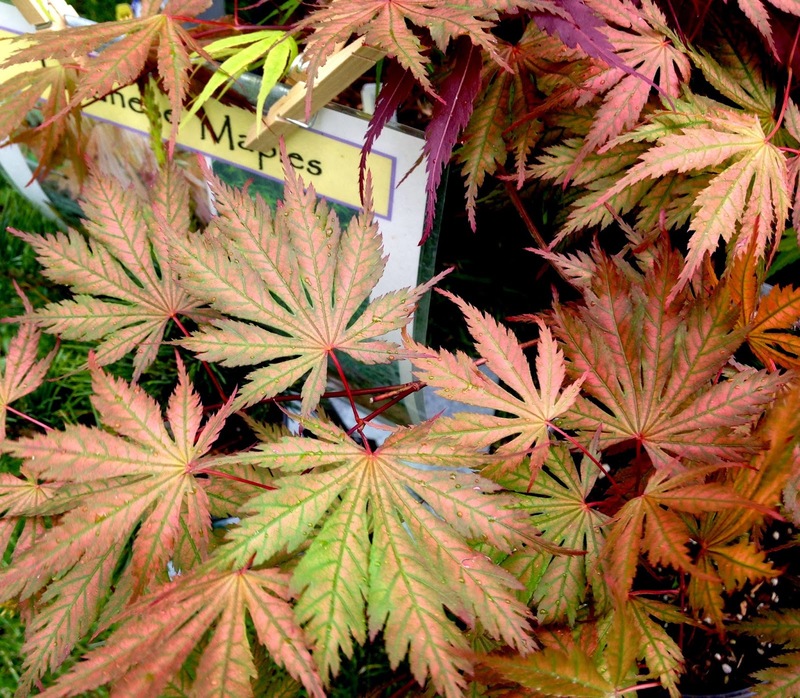 Last weekend I attended the Spring Plant Fair at the Clackamas County Fairgrounds. 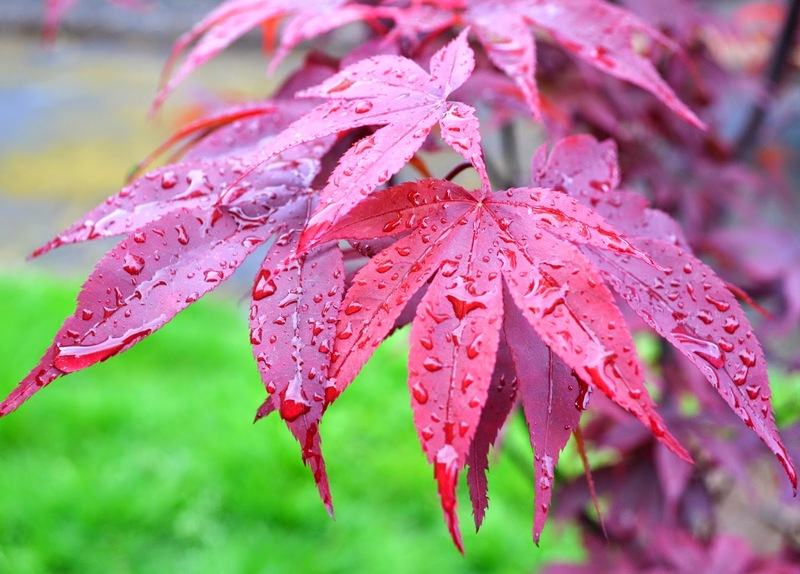 It was there that I first encountered Arbutus and their fine selections of Japanese Maples. 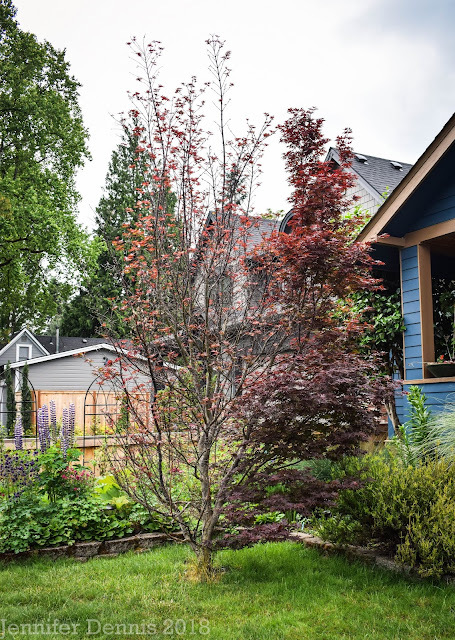 I had already spent my plant budget and of course fell in love with a beautiful, Twombly's Red Sentinel Maple that Arbutus had for sale. I've been searching for one to match the one I put in my front yard, before we even officially moved in a year and a half ago. We've recently had the house resided and painted the original Twombly is looking fantastic. I looked up Arbutus and saw that the nursery was having an open gardens this weekend. Hubby said he would buy the additional tree for me for a Mother's Day gift. Now that's what I'm talking about! I headed out to Yamhill County after I coached both of my kids indoor soccer games. The weather was intermittent with some heavy showers from thunder storm cells. Upon arrival, Arbutus owner Norm greeted us and gave us an in-depth tour of his gardens, including plant introductions and explanations. It was an incredibly entertaining treat. 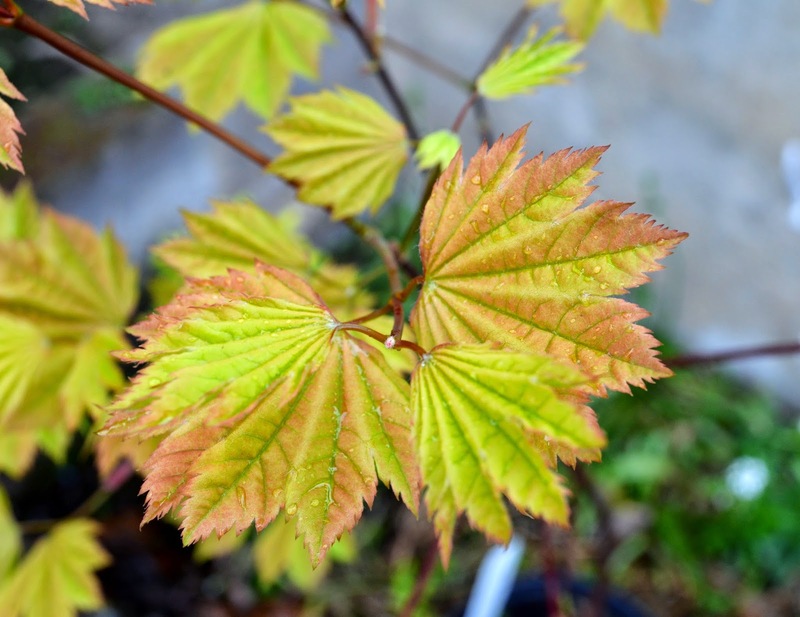 Norm specializes in propagating new species of Acer palmatums & circinatum. 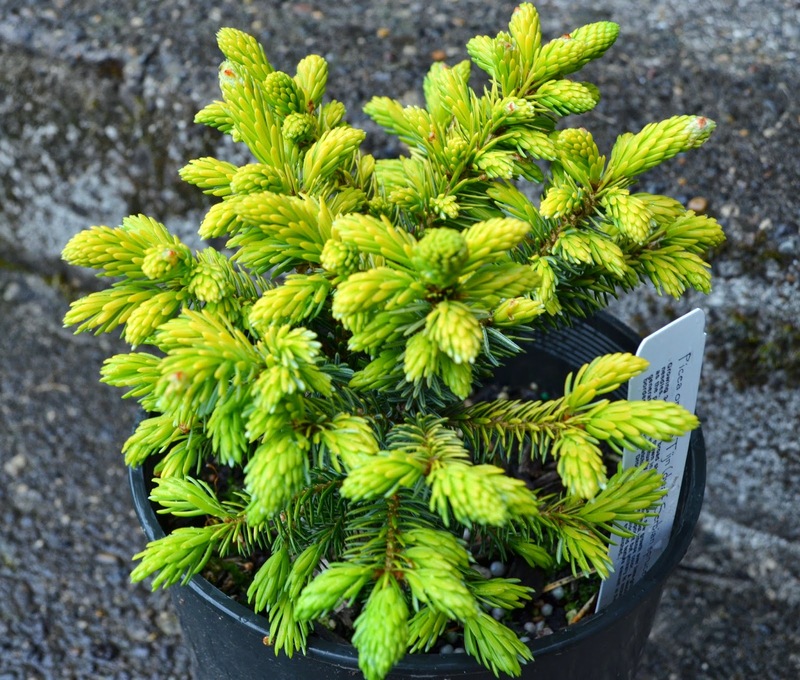 He has an amazing collection of dwarf conifers and epimediums. He can tell you stories and histories behind his plants. I am truly in awe of his gardens and life work collecting and propagating plants. His gardens are dry shade. 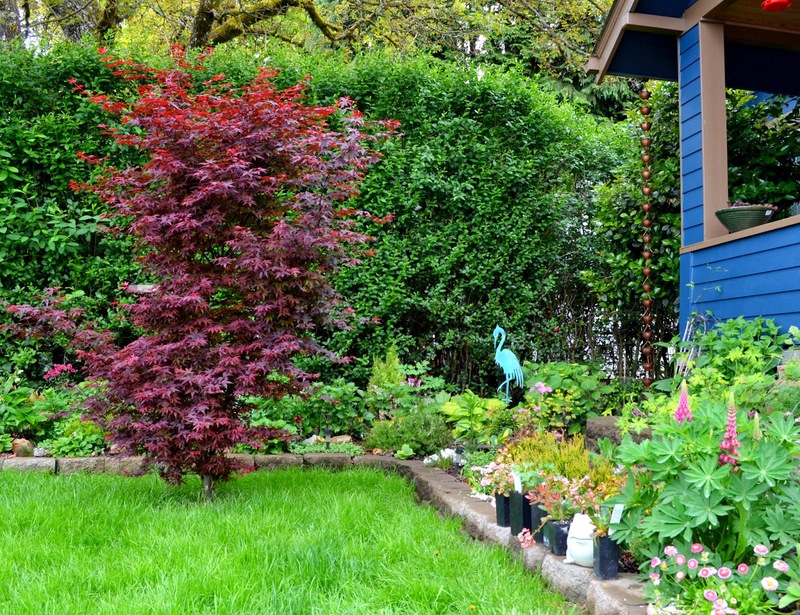 Over the years he has found plants that work and has stuck with those to build his under-story plantings. He used wood peonies, epimediums, lily of the valley, and low growing or 'table top' acer's under taller, upright Acer's. Really fantastic. His gardens had romantic, curving paths, wood bridges and stepping stones. Little bits of carefully placed garden art, mostly with an Asian theme and zillions of aquilegia blooming. I cannot express my disappointment that I lost all my pictures. I feel like a total heel. But, I can tell you that taking the drive out to visit Arbutus was well worth it. If you cannot spare the time to venture to the nursery, keep your eyes peeled for Arbutus at both the spring and fall Hortlandia plant sales. Take a moment to dig into Norm's fabulous plant mind and you'll be blown away at how much you can learn with a little time spent with him. Cheers and Happy Mother's Day. Sounds like a great place. I'm so pleased you got a vine maple. Good hubby! Dry shade, sounds familiar. Sounds like it's worth making the trip! Ah Jenni we've all done things like that, don't be so hard on yourself! Glad you got your tree, and then some! Oh well, these things happen... At least the sights are stored in YOUR memory, if not in a camera! Those acers really are special. I can see why you wanted to make the visit to Arbutus. Jenni, we all have days like those! LOL. Enjoy your new plants. Your commentary sails along even without the visual aids of photos. You made me want to visit Arbutus. Happy Mother's Day to you! What a fantastic gift (so pretty!). I'm putting this on my list of nurseries to visit. A whole nursery of dry shade? How spoiled are we in the Portland metro area? This sounds like a great nursery. I'm going to visit the website and see their photos. Sorry you didn't get your memory card but you had your priorities in the right place, mom. ;) Your new plants look wonderful. How fun.